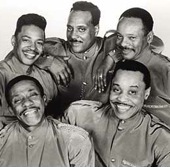 The Dramatics (formerly The Dynamics) were a soul music vocal group, formed in Detroit, Michigan in 1962. They changed their name by 1967, when they garnered their first minor hit, "All Because of You." However, the group did not break through until their 1971 single, "Whatcha See Is Watcha Get." Their members at this time were Ron Banks, William "Wee Gee" Howard (who died of a heart attack on February 22, 2000 at age 49), Elbert Wilkins (who died of a heart attack on December 13, 1992 at age 45), Willie Ford and Larry Demps. Shortly after the success of their first album, Howard and Wilkins left the group.